Equipment racks from LeadingEdge absorb radio frequency and vibration damage that affects all music systems, at all price levels. These are fundamental problems that actually react, or intermodulate, with the music signal, a process that destroys information – conventional component upgrading will not solve them. However good your equipment it cannot restore information that’s been destroyed by pollution. It is Vertex’s underpinning absorption technology, incorporated invisibly into beautifully-made platforms, that makes startling improvements to system performance. Technologies applied here are advanced, have solid scientific bases and impeccable pedigrees. The Vertex AQ acoustic energy absorption was developed from non-destructive testing of aircraft and its effectiveness in a music context has been proved by one of the MoD’s research agencies. The LeadingEdge RFI/EMI absorption methods stem from experience gained with complex installations in tight spaces in aircraft where mutual interference between electronics is a major problem. LeadingEdge components combine VertexAQ technology – established over 20+ years – with the acoustic knowledge of Kaiser Acoustics, built to craftsman-quality standards in Kaiser’s superb manufacturing facility in Bavaria. Download a brochure that describes the design principles and performance benefits LeadingEdge Brochure and also a catalogue LeadingEdge Components. Read about LeadingEdge acoustic panels for room treatment under Room Acoustics. 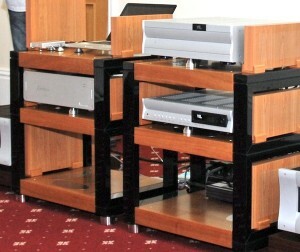 Each shelf or platform, shown below in a complete rack, is available separately in a choice of finishes as a stand-alone equipment support. Its performance is a significant improvement over even the previous Vertex HiRez platform. It may just look like a nice piece of wood but there’s magic inside! Within its furniture-quality veneered exterior it has four hidden talents: the crucially-important vibration draining feature found in earlier Vertex platforms, new RFI and EMI absorption using ‘Stealth’ material, an acoustic panel underneath to create a ‘quieter’ environment and adjustable height ‘Stop-choc’ feet that provide a high level of isolation from external vibration. 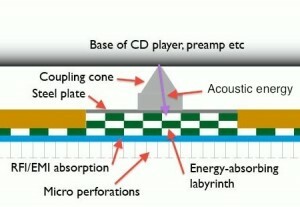 This diagram shows how energy over a wide frequency range is conducted swiftly from the base of the component by the cone into the labyrinth and absorbed. A layer of ‘stealth’ material in the platform absorbs RFI and EMI while the micro-perforations create a quiet environment in the space below. Mini Panels can be placed either side of the equipment to increase shielding from EMI and RFI. 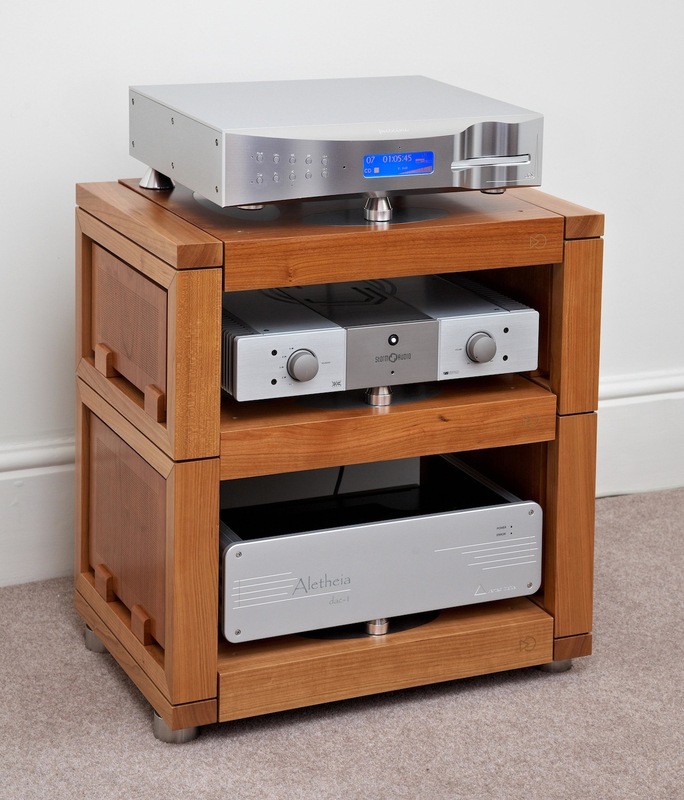 So, an electronic component on a middle shelf in a rack can now be screened from RF on four sides, drain its vibration into the platform and be shielded, again on four sides, from sound in the room. bass is deeper, tighter and has more character. All this detail is in the recordings but is crushed by RF and acoustic interference. Vibration in equipment –from internal transformers and conducted via the metal cables from the loudspeakers – is drained from the metal cases via a hard steel cone and one of the metal plates into the hidden labyrinth within the platform. 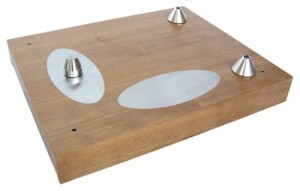 Platforms can be individually levelled, making them highly effective under turntables. An equipment rack can be built up in modular stages with the side frames supporting the platforms. 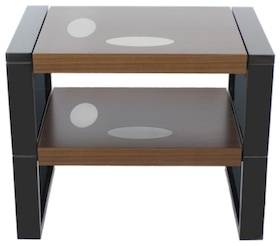 These frames can be veneered to match the platforms or painted in a suitable colour. A double-width LE rack in Light Oak. 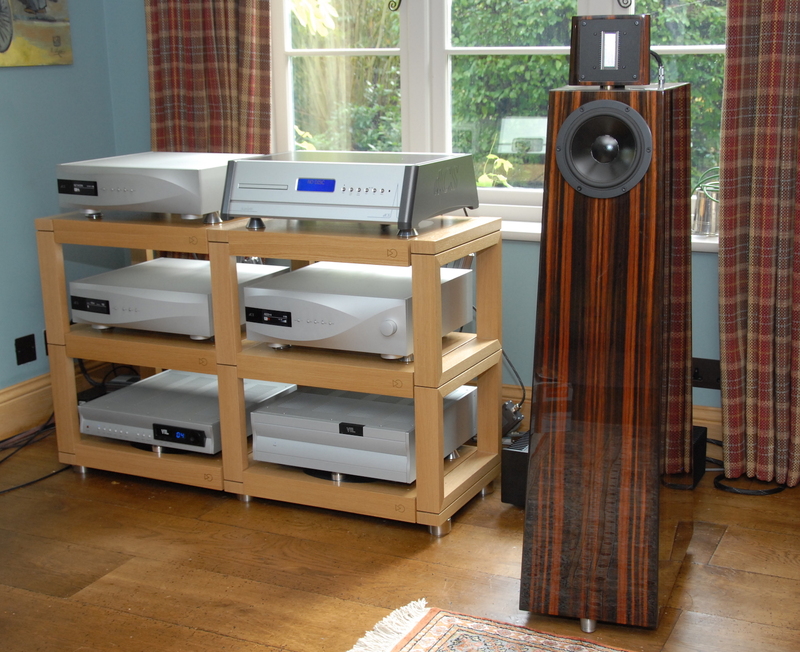 CD system by dCS with VTL 7.5 preamp, flanked by a Kaiser Classic speaker.